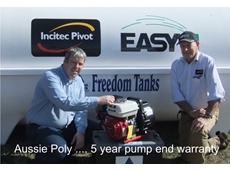 Aussie Ag Chem Poly Pumps are manufactured from glass filled polyester and are available in 2 different versions. Tuhorse Pumps is an Australian supplier of water and submersible pumps to industries such as the farming and agriculture sectors. Their range includes garden pumps, pool pumps, sewage pumps, submersible bore pumps and pump accessories. Aussie Pumps specialise in the manufacture and supply of high performance, self priming centrifugual transper pumps for a wide range of applications. Their range of products include hydro loop, blasters and drain cleaning jetters.